Cheetah. Cheetah was a young man from Rotterdam, Netherlands. Slight of build with blond hair, he was very quiet, traveled light and hiked fast. I first saw him at Mollies Ridge shelter in the Smokies. He stopped in, signed the register and continued on. He was particularly noticeable wearing his cheetah print jacket. Someone said at the time that he spoke little English which was why he was so quiet but later on when I did have a chance to speak with him, he spoke English sufficiently well to communicate with me. I caught up with him in southwest VA north of Pearisburg after a particularly severe thunderstorm. He had reached Baileys Gap shelter ahead of the storm. Red, Gary and I had not and came in wet. The shelter was full and cold on that wet afternoon. All of us were trying to decide whether to stay or go once the storm had passed. Cheetah was the first to leave. He shouldered his pack, announced that “after the rain, comes the sun” and was gone. Most of us did the same but without his enthusiasm or certainty. I saw him once or twice after after I jumped ahead to Delaware Water Gap to catch Red & Gary but he soon left us behind. R&G had hiked with him in Pennsylvania and learned that he had sewn most of his equipment, including his Cheetah jacket. My last recollection of him was his picture at Andover House in Maine. He was about three weeks ahead of me at that point and was probably nearing the end of the trail as I was viewing his picture. Cheetah was very impressed by the many kindnesses he received on the trail. He noted so in one shelter register and said that if any through hikers were to visit him in Rotterdam, he would serve them cookies and soda. Angelhair and Rigatoni (the Noodlleheads). I met this young couple at Carter Gap shelter on the day of my second big rain and learned that they were from New Mexico, practically neighbors. I rarely saw them again–they were usually a day or two ahead of me–but their shelter entries were quite notable, particularly their “top ten lists” (how to tell when your partner is about to leave the trail, how to tell when you’ve been on the trail too long) and account of their adventures on Hike Naked Day. I met them again at Delaware Water Gap. Rigatoni had punctured his foot in Pennsylvania and was laying up for a few days to heal. We crossed the Delaware River together but his foot was still bothering him and he bailed for additional treatment. Later on, I heard he was back on the trail but that Angelhair had gone to Phoenix due to her brother’s illness. 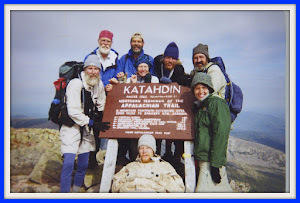 The last I heard was that she rejoined him in Vermont to hike north to Katahdin after which they would return to Vermont to hike south on the section she missed. Pickle & Pinata. This young couple turned up in NY-NJ sections of the trail. I think I saw them first at the St. Thomas Episcopal Church hostel in Vernon, NJ and encounted them off and on through Massachusetts. Pickle was a systems specialist who had been working as a consultant in Utah before hitting the trail. He was small of build with dark hair. He passed me on a hot July day just north of Southfields, NY cursing the state, a feeling I shared. Pinata was on leave from her job as a flight attendant. They began their thru-hike separately and fell together before I met them. We camped together at Tom Leonard lean to in Mass on a hot muggy and buggy night. They had just spent a couple nights in Great Barrington and even rented a car, something that seemed highly exotic to me at the time. Lost track of them for a while but met Pinata again at Panarchy House in Hanover, NH. She was looking particularly serene and relaxed. The reason was that she had left the trail at Sherburne Pass in Vermont and was now following Pickle using another thru-hiker’s car. By this time they she had decided to join Pickle in Utah after he finished. I saw her last in Gorham, NH but saw pictures of them in Maine at a couple hostels. Fullmoonwalking. One of the older hikers I met along the way, in his early to mid 60's, I think. He was a retired Air Force pilot who had flown in Vietnam and then spent 20 years as a stockbroker before hitting the trail. Despite his age, he was a strong hiker who was usually ahead of me. He was noted for falling, often several times a day but none of the falls were ever serious. His name referred to the fact that he had lost so much weight that his pants would fall down, although I never saw this happen and he always looked pretty healthy to me. He and his nephew, who joined him for a week in Maine, organized the one observance of the first anniversary of the 9/11 attacks that I saw on the trail. They asked thru-hikers to sign an American flag that they planned to carry to Katahdin. Rocky Top. A 6-4 (or so) Black man, Rocky Top was a truly unique thru-hiker. Not only was he the only Black thru-hiker I met but he was very outgoing and animated. I first met him in Damascus, VA at the Side Track Café. He made a point of introducing himself and striking up a conversation. He was actually more than 150 miles ahead but had returned to Damascus for Trail Days. He was hard to miss; in addition to his height and race, he was wearing a hat made from a number 20 grocery bag, his bushy beared flecked with gray. I didn’t see him for a long time but followed his progress in the shelter registers. We met again in Delaware Water Gap, PA and occasionally thereafer but he was usually well ahead of me. But he slowed down a bit toward the end and I caught up with him in Maine and had the opportunity to get to know him, one of the more pleasant and interesting experiences of the trip. During that time I got to know him better. He was a building contractor from Memphis, Tennessee who specialized in framing houses. Somehow, his free spirit on the trail didn’t quite fit with my idea of a contractor. I also learned that he would often hike long distances in a single day–I had read about a 34 mile day previously–but would then take long side trips. He said he spent five days in Troutville just checking out the area, including a visit to the Roanoke County Fair. He went to NYC for a Yankees game. After breaking his glasses, he made a two day trip to locate new frames, an excursion that involved much serendipity. He always looked kind of ragged, his frayed University of Tennessee ball cap and clothing that hung from his lanky frame probably contributed to that look. One night during the last week on the trail, he pulled into the shelter just before dark, cooked dinner and continued on. I was amazed that he could hike difficult trail in the dark (daytime hiking was enough of a challenge for me). He went up Katahdin the day before I did but turned up in Millinocket with Radar two days later. He was part of the thru-hiking crew that descended on Radar’s house for the end of hike party. I last saw him squeezing into a car for a ride to Asheville, NC, heading back to a life that he thought would be quite different having finished the AT. Pigchicken. Picgchicken was a tall, blond young man hiking the trail after completing Army service. First met him in late July north of Kent, CT. Saw him again as I was heading out of North Adams, Massachusetts in August most of what I knew of him was from in references from other hikers. Hiked, or rather camped, with him in Maine and shared hostel space with him there. His unruly hair, mustache and thick goatee reminded me of Confederate general Nathan Bedford Forrest. He had a reputation as a partier, at least on a couple occasions that I heard about. He was also prone to drawing, particularly his Pigchicken figure, in the shelter registers. Pigchicken was the only person at Caratunk House when we arrived and served as a stand-in for the owner. He was a man with a plan: finish the trail, spend a few months in Europe and begin attending college at Appalachian State University in North Carolina. Lost track of him in Maine when he headed into the Gulf Hagas area for a side trip off the AT. He showed up at Radar’s with Zues and Bert the night of the party. Left the next day heading home to Buffalo, NY. Hollywood. Met Hollywood at Delaware Water Gap and encountered him off and on into Vermont. He was in his late 20's but he looked older with his curly beard and hair. Can’t remember if he was showing gray hairs or it just looked that way. Hollywood was an avid photographer, devoting much time and effort to recording his trip. He had hopes of pursuing a MFA after the trail. Spent a leisurely afternoon with him in the woods across the road from Worthington Bakery where we ate sub sandwiches and drank beer waiting out the afternoon heat. The following day we lounged around the concession stand at High Point State Park. Camped with him often in Vermont but never saw him again after Killington Peak. He went to the summit to camp and see the sunrise on his birthday and never caught up with us. Dharma, Polish Ninja, Kali-Frodo & Cap’n. Our companions on Katahdin summit the last day of our hike. I’d seen their names in the shelter registers along the trail but didn’t meet them till I was in Maine. Met Dharma in Andover and he was with the other three at the White Wolf Inn in Stratton. We leapfrogged them in the Hundred Mile Wilderness but they passed us when we headed into Whitehouse Wilderness Camp. Cap’n told me they met in the south and vowed to go up Katahdin together and somehow it had worked out so that they would. After they passed us in the Wilderness, I did not expect to see them again but our 25 mile day from Rainbow Springs to Katahdin Stream put us at Katahdin’s base with them. They went up ahead of Red, Gary and me but were still there when we arrived at the summit. And so, they became our summit family sharing the ecstasy of the trail’s end with us.